Follow-up to "Arc-V" delayed by a month. With Yu-Gi-Oh! Arc-V quickly approaching its end point, fans have been waiting eagerly for the beginning of the next series, Yu-Gi-Oh! VRAINS. However, while it was originally announced that the new season would start in April, a recent magazine spread shows that the beginning of the broadcast will apparently be delayed. The latest ad in Weekly Shonen Jump shows that the show will be starting in May, and airing on Wednesday evenings. 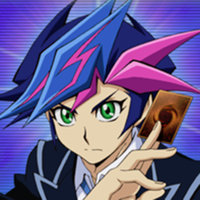 However, there will be a special to promote the new series on April 5 at 6:25 pm, titled Yu-Gi-Oh! LABO. 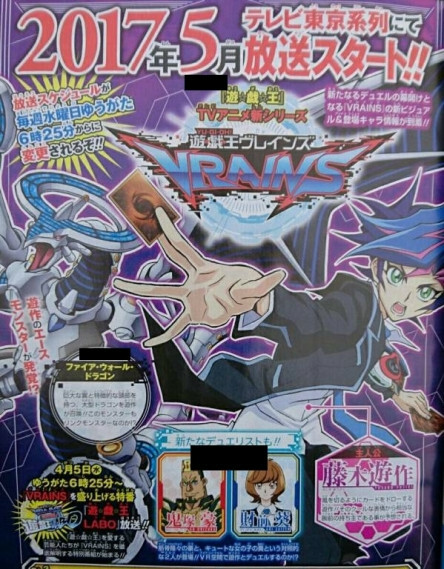 In addition, the new ad teases two more duelists: Gou Onizuka and Aoi Zaizen. Yu-Gi-Oh! VRAINS will feature duelists in a specially constructed virtual world, bringing monsters into play via a technique known as Link Summoning. This new ad shows protagonist Yusaku Fujiki as he appears outside the virtual arena. Sentai Filmworks Licenses Studio Colorido's "Typhoon Noruda"